Now that we’ve gotten that out of the way, let’s talk about some more interesting pairs with everyone’s favorite (or least favorite) machete. It’s basically the Sniper default melee of choice these days, just because it’s the only Sniper melee with interesting stats. Even Valve agrees; the earliest ever strange Sniper crate contained a strange Bushwacka, whereas the Strange Kukri had to wait over two years later to exist. Though despite its versatility, you can’t snipe with it. Picture by Sharpaim. 2. The Cleaner’s Carbine: Ever since the stat adjustment where the weakest hitscan weapon in the game had its bonus changed to “On Kill: Gain 8 seconds of minicrits“, the Bushwacka and it have become odd but complimentary bedfellows. It’s certainly no puff-and-sting, because it’s kinda difficult to kill one person, then melee a second in the next 8 seconds, but it gives you a better fighting chance than without those 195-damage minicrits. 3. 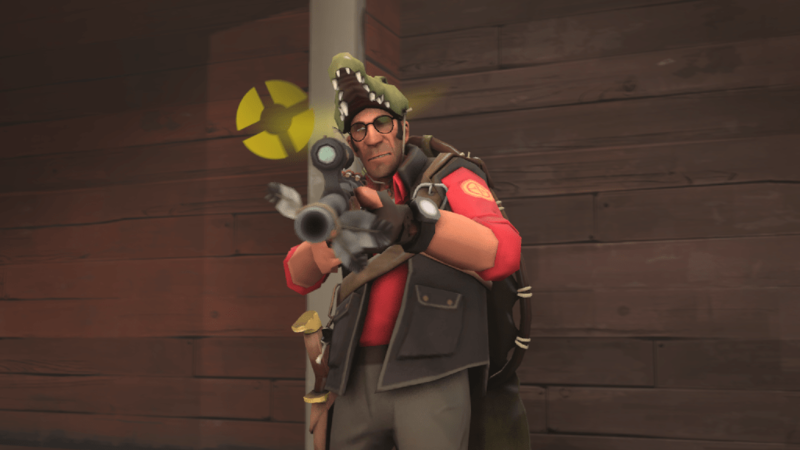 The Croc-O-Style set: Sure, it doesn’t make you immune to headshots like it used to, but these three weapons still go together pretty well (plus now your victims leave sweet tombstones). The Danger Shield’s health bonus makes up somewhat for the fire weakness, and if you can land close-range scopes you can still apply the jarate debuff for the melee combo. Before the set bonus was removed, “Circling TF Logo” Ole’ Snaggletooth was the top meta-themed unusual in the game. Picture by Zombie Hugger. 4. The Cozy Camper: This one doesn’t synergize with Bushwacka’s upside as much as it compensates for the downside. Thanks to the +1 hp regen per second, you are less likely to die from the fire that is currently dealing extra damage to you. Any medic will be able to tell you that regen isn’t enough in itself to survive fire, but it helps. There’s nothing the Bushwacka DOESN’T synergize with. At worst, the relationship is neutral. Picture by supermarikfuntime. 5. The Buff Banner: And everyone else’s sundry ways of giving teammate’s mini-crits, but this particular combo I’m mentioning more for Mann Vs. Machine, where you can guarantee friendly soldiers will be using it. When your team has a Soldier, there is no other Sniper melee you should consider using, and once you’ve got some spare cash consider upgrading your swing speed because together you and Buff Banner soldier can solo (duo?) tanks. 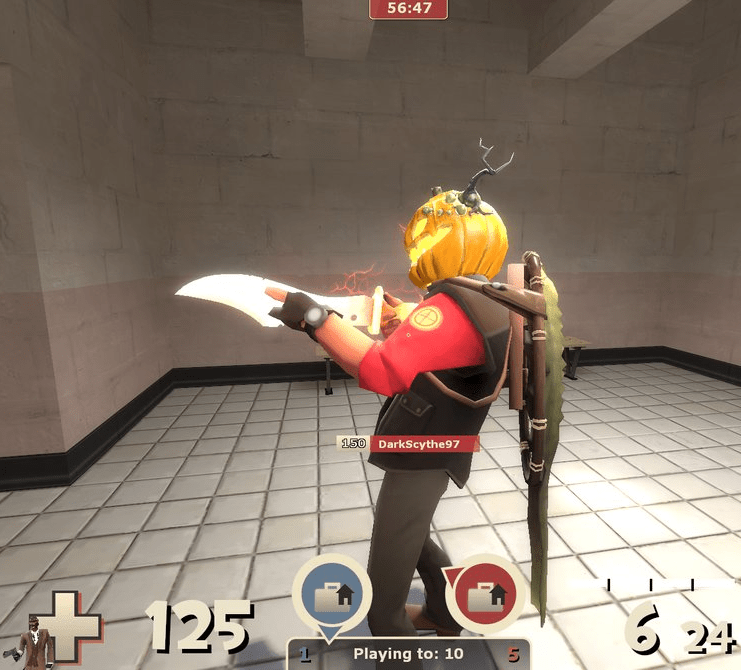 Considering that normally Snipers are the second-most useless class against tanks, a melee weapon turning him into the #1 tank slayer in TF2 is a pretty big deal. This weapon used to bug the hell out of me back when it got random crits, but now that it doesn’t, I think it fills a valuable if somewhat loadout-dependant niche in Sniper’s arsenal. Though the downside is pretty inconsequential and it calls into question the balance of the Sniper melee slot, I can forgive this because other classes have it far worse, and the machetes in competition with the Bushwacka are very boring. 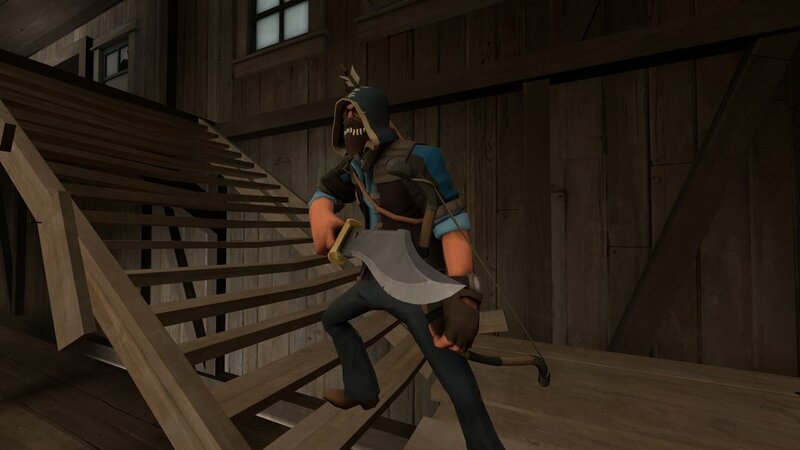 Personally I wish Valve would incorporate more interesting unlock concepts like this one into the game, but until then the Bushwacka is a powerful and versatile machete to give ’em the ole chop chop. ← A couple of things that TF2 really needs and still doesn’t have.